The Constitution of the State of Nebraska distributes the judicial power of the state among the Supreme Court, Court of Appeals, ­district courts, and county courts. All state courts operate under the administrative direction of the Supreme Court. In addition to the courts created by the Constitution, the Nebraska judicial system has two other courts – the separate juvenile courts located in Douglas, Lancaster, and Sarpy Counties, and a statewide Workers’ Compensation Court. The Supreme Court consists of a Chief Justice and six associate ­justices. The Chief Justice, who represents the state at large, is appointed by the Governor from a statewide list of candidates selected by a judicial nominating commission. The six remaining associate justices are chosen by the same judicial nominating commission procedure but each represents one of six districts. These judicial districts are approximately equal in population and are redistricted by the Legislature after each census. The Supreme Court’s basic responsibilities are to hear appeals and provide administrative leadership for the state judicial system. The Supreme Court has the authority to be the original court in which a case is heard under certain circumstances. The Supreme Court also hears all appellate cases regarding the death penalty, the sentence of life imprisonment, or constitutional questions. Upon the granting of a petition for further review, a Court of Appeals case is moved to the Supreme Court for review. Besides appeals, the Supreme Court is responsible for the regulation of the practice of law in Nebraska. The Supreme Court handles the admission of attorneys to the Nebraska State Bar Association, as well as attorney discipline. This membership is mandatory in order to practice law within the state. Another responsibility of the Supreme Court includes the monitoring and appointment of attorneys to serve on local committees of inquiry, as well as state committees on discipline and professional responsibility. In 1990, the Nebraska Legislature proposed a constitutional amendment that would create an intermediate Court of Appeals. In November 1990, the voters of the State of Nebraska approved the amendment, and the Court of Appeals was established on September 6, 1991. The Court of Appeals consists of six judges appointed by the Governor from lists submitted by judicial nominating commissions. From the six judges, a chief judge is selected to serve a 2-year renewable term. The districts from which the Court of Appeals judges are appointed are the same as those used for the six Supreme Court justices. The Court of Appeals’ primary courtroom is in the State Capitol in Lincoln, but for the convenience of citizens, the Court of Appeals travels to other Nebraska cities to hear appeals. The Court of Appeals is divided into two panels consisting of three judges each. The panels decide separate cases to expedite the processing of appeals. The composition of the panels changes periodically so that all the judges work with each other at some time. The appeal process requires all cases (except cases in which a sentence of death or life imprisonment is imposed and cases involving the constitutionality of a statute) be appealed to the Court of Appeals rather than to the Supreme Court. In cases appealed to the Court of Appeals, a petition to bypass may be filed with the Supreme Court. If the Supreme Court deems it necessary, the petition will be granted and the case will be moved to the Supreme Court docket without first being heard by the Court of Appeals. Besides a petition to bypass, a petition for further review may be filed. This petition is filed after a case has been decided by the Court of Appeals and one of the parties involved is not satisfied with the ruling. The Supreme Court has the discretionary power to grant or deny the petition. If the petition is denied, the Court of Appeals’ ruling stands as the final decision. If the Supreme Court grants the petition, the case is then moved to the Supreme Court for review and disposition. The district courts are Nebraska’s general jurisdiction trial courts. This means that with a few exceptions, civil and criminal cases of all types may be commenced in and tried by the district courts. District courts also function as appellate courts in deciding appeals from various administrative agencies and from most county court cases. When acting as an appellate court, a district judge reviews the record of testimony and evidence from the county court or administrative agency in order to rule on the appeal. Each county in the State of Nebraska has a clerk of the district court performing the administrative duties associated with the court. Nebraska law states that counties with 7,000 inhabitants are required to have a clerk of the district court elected by the voters. In counties with less than 7,000 inhabitants, the county board and district judge determine whether there should be a clerk of the district court. If the position of clerk of the district court does not exist in the county, the county clerk is the ex officio clerk of the district court. Besides being the clerk of the district court, he or she also serves as the court’s administrative officer. The county courts are trial courts with specified limited jurisdiction. All small claims, probate, guardianship, conservatorship, adoption, and municipal ordinance violation cases are filed in the county courts. Except in Douglas, Lancaster, and Sarpy Counties, where juvenile cases are handled by Separate Juvenile Courts, most juvenile matters are handled by the county courts. County courts conduct preliminary hearings in felony criminal cases. The county courts have concurrent jurisdiction with the district courts in some divorce cases and other civil cases involving $53,000 or less. They also have concurrent jurisdiction with the district court in misdemeanor criminal and traffic infraction cases, but nearly all of those cases are prosecuted in the county courts. Except in Douglas, Lancaster, and Sarpy Counties, clerk magistrates are responsible for the administrative functions of the county court offices. In Douglas, Lancaster, and Sarpy Counties, these duties are performed by judicial administrators. Besides administrative duties, clerk magistrates have limited judicial responsibilities which may include accepting pleas in traffic and misdemeanor cases, setting bail, and performing weddings or other judicial services. These officers are hired by county judges of the district in which they serve. Nebraska has three separate juvenile courts located in Douglas, Lancaster, and Sarpy Counties. In the remaining counties, juvenile matters are heard in the county courts. Separate juvenile courts are courts of record and handle matters involving neglected, dependent, and delinquent children. The court also has jurisdiction in domestic relations cases where the care, support, or custody of minor children is an issue. The three separate juvenile courts have the same jurisdiction and employ the same procedures as the county courts acting as juvenile courts. The Nebraska Workers’ Compensation Court consists of seven judges who have statewide jurisdiction. Because of the statewide jurisdiction, the judges are required to travel to all parts of the state to hold hearings. The Workers’ Compensation Court administers and enforces all provisions of the Nebraska Workers’ Compensation Act, which includes original jurisdiction of all claims for workers’ compensation benefits resulting from occupational injuries or illnesses. All industrial accidents are required to be reported to this court. Disputed claims for workers’ compensation are submitted to the compensation court for finding, award, order, or judgement. Appeals may be taken to the Court of Appeals. The financing of Nebraska’s trial courts is a combined state and county responsibility; the Supreme Court and Court of Appeals are entirely state-funded. Approximately 2 percent of the total state budget is appropriated for the judicial branch. The State of Nebraska pays approximately 90 percent of the cost of the county court system. It pays all personnel costs of the judges, clerk magistrates, and their staffs. Counties are responsible for providing office supplies, equipment, and ­facilities. Salaries and expenses of the district court judges, separate juvenile court judges, and their court reportering personnel are paid by the state. The counties are responsible for other personnel and operating costs of the district and separate juvenile courts. 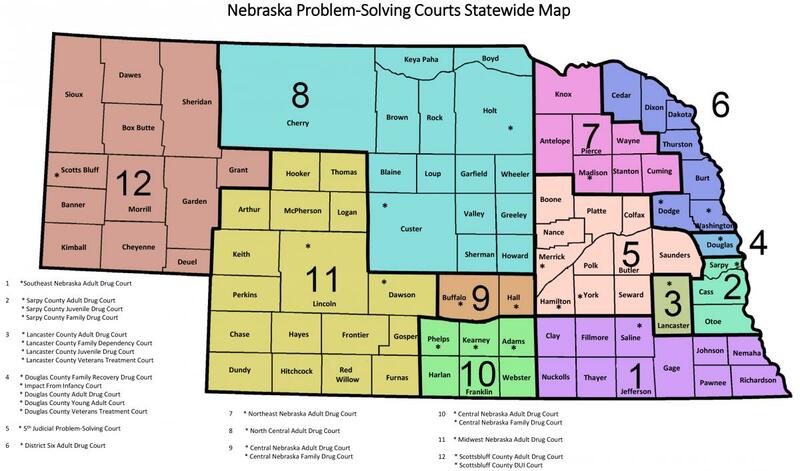 To learn about the distribution of court-generated revenue, go to Nebraska Courts by the Numbers. The merit selection system is used for the selection and retention of Nebraska judges. When a judge resigns, retires, dies, or is removed from office, the vacant position falls under the discretion of a judicial nominating commission. Each judicial nominating commission is made up of four lawyers selected by the Nebraska State Bar Association, four nonlawyers who are appointed by the Governor, and a nonvoting Supreme Court justice ­acting as chairperson. The judicial nominating commission must not have more than two lawyers or two nonlawyer members from either political party. A judicial nominating commission holds a public hearing to interview candidates who have submitted their names for the open position. The judicial nominating commission submits the names of at least two qualified attorneys to the Governor. Generally, the Governor decides who will become the new judge. However, if the Governor elects not to make an appointment within 60 days after receiving the list of nominees from the judicial nominating commission, the Chief Justice of the Supreme Court makes the appointment from the list of nominees. Applicants for positions on all levels of Nebraska courts must meet a number of requirements in order to be appointed to office. Each person must be a U.S. citizen, be at least 30 years of age, and have practiced law a minimum of 5 years in the State of Nebraska. The person must also be currently admitted to practice before the Nebraska Supreme Court. The Judicial Nominating Commissioner's Manual contains detailed information on the merit selection sysem. A judge must run for retention in office in the first general election that occurs more than 3 years after his or her appointment, and every 6 years thereafter. When a judge runs for retention in office, the question presented on the voters’ ballots states: “Shall Judge___________be retained in office?” If more than 50 percent of the voters indicate that the judge should not be retained, the judge is removed. The merit system was adopted by a constitutional amendment in 1962. Originally, it applied only to the selection of judges to the Supreme Court and district courts. Since then, it has been extended to include all of Nebraska’s state judges. In the State of Nebraska, there is no mandatory retirement age for judges, but they may retire at the age of 65. Earlier retirement due to disability may be granted. The Commission on Judicial Qualifications reviews complaints submitted by the general public regarding the behavior of judges and has the authority to recommend judges, as well as to order formal hearings. According to statute, a judge may be disciplined for behavior which violates the laws and purposes of his or her office. In addition, a judge may be disciplined for misconduct in office, failure to perform his or her duties, frequent intemperance, or conviction of a crime. Once charges are established upon clear and convincing evidence, the commission may recommend to the Supreme Court that a judge be reprimanded, censured, suspended, removed, or retired. Disciplinary suspension of a judge does not create a vacancy in the office, although the judge may be suspended without pay for a period not to exceed 6 months. The Commission on Judicial Qualifications consists of 10 members: the Chief Justice, who serves as its permanent chairperson; three judges appointed by the Supreme Court; three attorneys appointed by the Nebraska Bar Association; and three lay members, or citizens, appointed by the Governor. Most legal matters filed in Nebraska state courts are classified as being civil or criminal in nature. In a civil action, the party bringing the action (plaintiff) must prove his or her case by presenting evidence that is more convincing to the trier of fact (judge or jury) than the evidence of the opposing party (defendant). Criminal cases are brought by the state against individuals or groups of individuals accused of committing a crime. The state initiates charges because crimes are considered acts against all of society. The prosecuting attorney files the charge against the accused person (defendant) on behalf of the state (plaintiff). The prosecution must prove to the judge or jury that the defendant is guilty beyond a reasonable doubt. Back to top. Probation functions within Nebraska’s Judicial Branch, providing Presentence Investigations (PSI) as ordered by the Court, and supervising individuals sentenced by a Court to a term of probation or post-release supervision. Presentence Investigations are a comprehensive background investigation ordered by the Court as part of the sentencing process. PSI’s are generally completed when an adult has been convicted of a felony, as well as certain misdemeanors. As required by state statute, a PSI includes an analysis of the circumstances attending the commission of the crime, the offender's history of delinquency or criminality, physical and mental condition, family situation and background, economic status, education, occupation, and personal habits, and any other matters that the probation officer deems relevant or the court directs to be included. There are also three official types of probation supervision available to the Court as a sentencing alternative. Traditional, intensive supervision (ISP), and post-release supervision (PRS). Since 2006 the Nebraska Probation System has been engaged in programming designed to reduce the likelihood a person will recidivate. Individuals placed on probation receive supervision and services based on their assessed risk score. The higher the person’s risk of recidivating (engaging in additional criminal activity), the more intensively they are supervised. The probationer’s at the highest-risk of recidivism are also referred to probation-operated Reporting Centers, where supervision services and interventions designed to reduce future risk of reoffending occurs. The Nebraska State Probation System is a state-financed system. In Nebraska, juvenile probation supervises those youth who are found responsible for committing a delinquent or status act. Juvenile probation is responsible for statewide administration of detention intake and alternatives, investigations, case management/supervision, services including placement, and reentry for those youth who are placed outside their home. Juvenile probation strives to prevent juveniles from returning to the juvenile justice system or entering the criminal justice system by: engaging juveniles and their families in the juvenile court process; eliminating barriers to accessing effective treatment and services; and partnering with educational and community stakeholders. Youth who commit crimes are different from adults: their brains are less developed and they have a greater capacity for change. Therefore, states have established a separate court system for juveniles, and have created a separate, youth-based service delivery. The juvenile justice system has grown and changed substantially since 1899, when the nation’s first juvenile court was established in Illinois. Today’s juvenile justice system provides a balanced approach. While juvenile probation officers still have a primary responsibility to hold youth accountable, enforce orders of the court, and ensure public safety the punitive aspect is diminished. Probation officers also have a primary responsibility to facilitate youth rehabilitation. The Constitution of the State of Nebraska, as amended in 1970, vests general administrative authority in the Supreme Court over all courts and provides that this authority shall be exercised by the Chief Justice. It also states that the Chief Justice will be the executive head of the courts and may appoint a court administrator as an administrative director, and a probation administrator. The Administrative Office of the Courts and Probation is located in the State Capitol in Lincoln, Nebraska, close to the Supreme Court. Office responsibilities include developing coordination within the judicial branch and with other state agencies about programs affecting the courts, developing plans for improvement of the judicial system, and serving as central management for the judicial branch. The Office of Dispute Resolution coordinates the development of mediation centers throughout the state. Mediation is an alternative, or supplement, to the courts as a means to resolve problems. Mediators are neutral individuals who assist conflicting parties in resolving their own problems mutually. All types of civil cases, such as family matters, landlord/tenant, employer/employee, community, and business disputes can be handled by the mediation centers. The child support referees assist district courts throughout the state with matters relating to the support of children and paternity. The referees hear cases and make recommendations to the district court judges on the establishment, modification, enforcement, and collection of child support, as well as on paternity establishments. There are two child support referees in Douglas County, one in Lancaster County, and one with statewide jurisdiction.